The phone versus the Echo – or is it: While Jeff Bezos noted at Code Conference 2016 that “voice interfaces won’t replace phones altogether” he did note that AI as a field of interest is growing. However, in her annual Internet trends report, venture capitalist Mary Meeker points out that the Amazon Echo sales are growing just as iPhone sales are starting to fall. While our phone are always with us, as more and more Alexa enabled devices become integrated into more devices like the Triby and the new Pebble Core, part of the functions of our phones may be incorporated into other AI-enabled devices. Jefff Bezos thinks that Alexa has the potential to become the fourth pillar of Amazon, although some people think it needs to get better at search first. More Home versus Echo: There has still been a lot of interest in the idea that Google Home will be competing with Alexa and the Amazon Echo. While we will have to wait and see on that front as the Home doesn’t actually exist as a finished product as yet, we are learning more about the Home. Not surprisingly, the Home seems to be based on the existing Chromecast and not on Android. That probably means a cloud-based solution much like Google search. Given the price of the current Coogle Chromecast and Google audio what, that probably means that the Home will come in much cheaper than the Amazon Echo, depending on speaker quality. Echo on the Web: Yes and No – This week, there was a big deal made out of the fact that there was an Echo Sim site up on the web at https://echosim.io/. 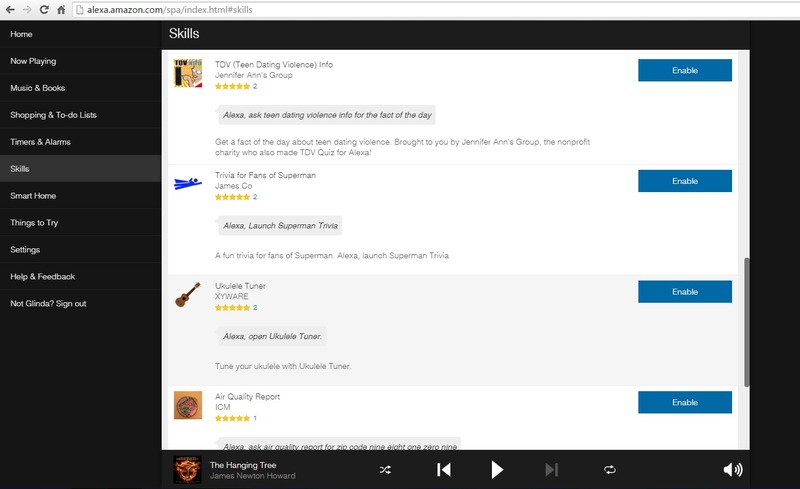 The truth is, that is a test site for developing Alexa skills. It is not intended as a “try-before-you-buy” site to see how the Echo works. Trust me, if they worked as slow and as badly as that site does, I would have sent both the Echo and the Tap back in a heartbeat. Fortunately, the real devices are a lot better! Need more help with Alexa on your Echo or your Tap? Here’s the help page. This entry was posted in Echo and Alexa and tagged Alexa App, Amazon Echo, Amazon Tap, Echo Sim, iPhone, Triby. Bookmark the permalink.